The African Grey Parrot is probably the most popular pet bird and is known to be the most intelligent and the most talkative of the parrot family. African Greys are excellent companions and will keep you on your toes. Not only can Greys learn a large vocabulary (some more than 1,500 words! ), but they can learn how to speak in different voices. I have known African Greys that sound exactly like their owners and are able to successfully call the dog and even trick them into thinking the sliding glass door has just opened because of their unbelievable sound imitating abilities. African Greys tend to be one-person birds, so it is important to socialize them with more people on a regular basis. Greys need plenty of interaction and things to do. Many become feather pluckers simply out of boredom. These pet birds need good mental stimulation, so providing them with plenty of puzzle-like and interactive toys is a must. Teaching them tricks is another good way to stimulate their smart little minds. There aren’t really any differences between these two subspecies other than the way they look. Congos are the more popular of the two, but are said to be more high strung. Some people believe that Timnehs make better pets. I personally think this depends on each individual bird, so I encourage you to interact with a few African Greys and see for yourself. Color Differences Congo greys are silver or light grey with bright red tail feathers and black beaks while timnehs are smaller and a dark charcoal color with maroonish tail feathers and a reddish cast to their beaks. 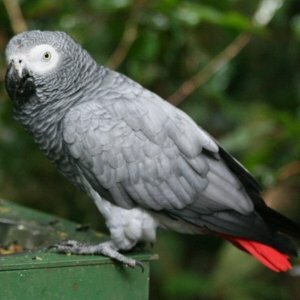 Owner African Greys require an experienced owner. Noise African Greys are relatively quiet–they are not known to scream. For this reason, they are fine to keep in an apartment. Qualities Great talkers, can imitate voices and sounds, very intelligent, highly tuned in to owners’ moods, known to be able to use speech in context, can be high strung and nervous (so you may need to be careful when introducing new toys or surroundings), not great for a household with young children (older children ok), tend to be a one-person bird unless well socialized, need an owner that is gentle, patient, and attuned to their needs, males can be more aggressive than females, can become feather pluckers out of boredom. Abilities Excellent – Known for their talking abilities. African Greys are capable of learning a large vocabulary (some as much as 1,500 words!) as well as speaking in different voices and some use words in context. Interaction/Time Requirements African Greys need daily interaction as well as socialization with other people (or they may become a one-person bird). See How African Grey Parrots Compare to Other Types of Pet Birds! African Greys are truly amazing parrots. They are the most popular parrots seen on television and in animal shows. This video is a great example of how intelligent and entertaining they can be! This video shows how Congos can learn to talk very well at a very young age! 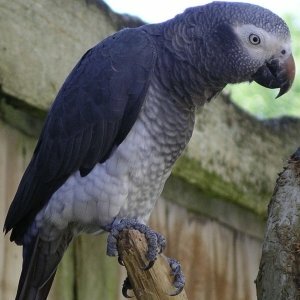 African Greys are not only talented in studies, but also as pets. This humorous video shows the vast vocabulary (and accurate voices!) that African Greys can have. It also shows that these parrots can very likely understand what they are saying. African Greys have a habit of becoming very aggressive and sensitive birds, so it is important to train them correctly right from the beginning. African Greys can be fantastic companions. They are caring, loving, and they can become very attached. However, if not properly trained, they can be very nervous and may never want to leave their cage. For these reasons, we highly recommend that you find an effective training program for your African Grey. Whether your African Grey is new to your home or you’ve had him for years, a training program will always come in handy. 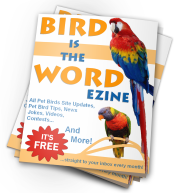 We personally recommend the Bird Tricks Parrot Training Course by Chet Womach. You can see many of his videos for free to get an idea of how much he knows about parrots and how he can help you train yours. Below is one of Chet’s videos that discusses two tips on how to train your African Grey. This video is a great example of how effective the training courses are and how they are filled with a wealth of useful information for any bird owner. 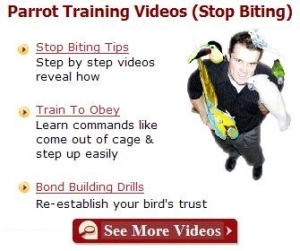 This video is really only the first step in getting your bird tamed. 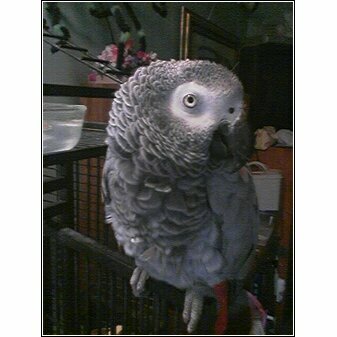 We highly recommend checking out Chet’s curriculum for taming your African Grey even further. Have A Great Story About Your African Grey Parrot? Your story may just help someone decide whether or not this pet bird is for them. Have A Great Story About Your African Grey? Hi, I would love to have an African Grey with me for such a long time. I am afraid that its written, its not suitable for untrained owners. Is it so? I have had Love birds as a kid atleast 20 of them…..Is that knowledge enough or should i do something else before buying one? I dont want to torture the bird after buying it without enough knowledge. Can anyone have any sort of advice…. my bird is sick looking weak easily fall off from its hang toy cage, cant stand well and also having leg crowns. please advise me what to do I don’t want the bird die pls. You need to take your bird to the vet immediately. Do not wait – go now. Your bird is very very sick and needs a medical evaluation and treatment right away. I have a Congo African Grey Parrot named Bingo. Bingo and I have been together for 11 years. Bingo was born in 2000 and is about 11 years old (about the age of a human teenager). I always believed that Bingo and I would grow old together. Bingo is my best friend. I am going to loose my home this month and I need to find Bingo someone who will love him as much as I do. Please email me if you know of someone. Where are you located? I’m in northern Californi. I can’t begin to tell you how sorry I am. My Congo is my baby. I hope things are working out well for you. Losing a pet is never easy, especially in the sort of circumstances you’re in.. I wish both you and Bingo the best. Hi Cheryl. Have you found a home for Bingo yet? My bird April ( we were both born on April 1) just passed away and I am overwrought with loss. He was my baby and best friend. If Bingo is truly a wonderful bird, I would consider myself very fortunate to to take him for you and would do everything possible to make him happy. Please let me know if you might be interested. Thank you. Sounds like you are East Coast. I hope you found him a good home. I am wanting to get an African Grey soon, but I have to find somewhere to buy one from first. Aziza, my 7 year old pet Congo African Grey, is wonderful. She talks a blue streak, whistles (she even whistles the Jet gang whistle from West Side Story! ), and she hoots when she wants my attention and can’t give it to her right at the moment. She’s a fantastic companion, and I can’t imagine living without her. What do I do when our African grey lays an egg several years apart ? Should I remove the egg immediately? Thank you. My girlfriend used to be the one our Congo African grey would regurgitate with but now he does it with me! He’s a little shy and aggressive when out of his cage and can be territorial with strangers but our Congo African grey age 17 is my best buddy and I love the heck outta him. We got Cookie earlier this year. She’s a flipping brilliant, loving bird and we’re proud to have her as part of our family. She’s good with all the family, she says MUM, What Your Name, You like SWEETS, ello, cookie, and you’re a good girl. She does our home phone ring tone, cat noises meow, she laughs, and she copies my little brother Billy’s scream. So I rarely ever put my Timneh African Grey in her cage. One night, I was watching TV with her next to my bed and fell asleep. About an hour later, I got woken up by June standing right in my face saying “What ya doin’? Huh? What ya doin’?” and making kissing noises. I told her I’m sleeping and moved her away from my face. She kept coming back and asking the same question. She had never said that phrase before. This just goes to show how smart Greys are and that they are always learning from their owners.